Miami assistant Nick Petraglia (photo by Cathy Lachmann). Typically news for a college hockey team wanes after its season ends. Miami’s postseason was halted in the first weekend, concluding with a 4-3 overtime loss in Game 3 of an NCHC Tournament opening-round series at St. Cloud State. But just a week later, the RedHawks announced both of its assistant coaches – Nick Petraglia and Brent Brekke – will not return to the bench in 2018-19, and several of its players also won’t be back this fall. Brekke has been a coach at Miami the past 10 seasons, and Petraglia has been an assistant for eight campaigns. Director of hockey operations Tommy Hill is expected to take over the position of Petraglia, who will remain with Miami’s athletic program in a different role. The other position has already been listed online and applications are being accepted. Four players from Miami’s 2017-18 roster have also reportedly been cut after the team finished 12-20-5. 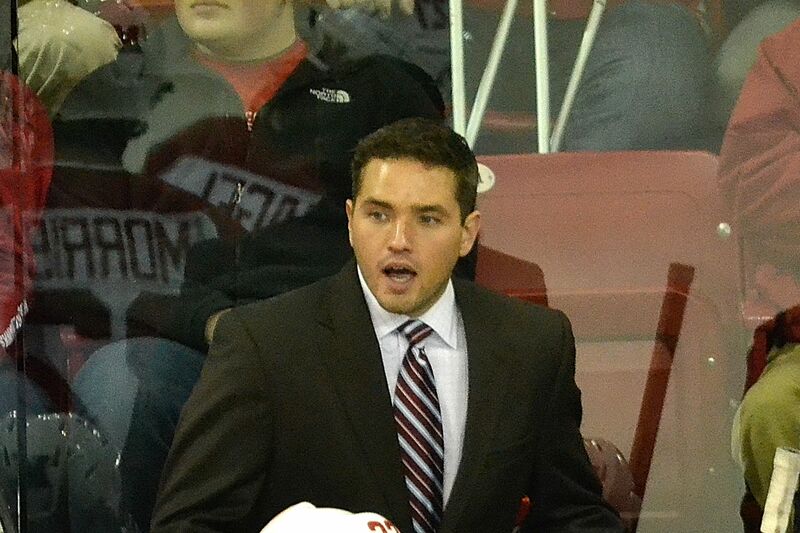 A wild card in the coaching shake-up is Dean Stork, who took a volunteer assistant position for the RedHawks this past season. He has been wildly successful coaching in the ECHL, helping lead the Cincinnati Cyclones to multiple Kelly Cup championships. For the third straight year, the RedHawks have failed to reach the NCHC Frozen Faceoff, the NCAA Tourament or even the .500 mark. Miami finished last in the conference this season and dropped its first-round conference series, two games to one. BoB: Obviously you’ve got some big shoes to fill on defense, losing three solid starters in Matthew Caito, Chris Joyaux and Taylor Richart. Can you talk about the incoming group of defensemen? Petraglia: Yeah, so we have four new guys on the blue line – that’s half our D-corps – so there will be a lot of opportunity back there. Grant Frederic – Coming in from Green Bay, he was a leader and a captain there, plays a really sound game at both ends of the rink. He’s big, he’s physical, he has a good stick, he takes pride in playing defense and making the right play. Offensively, he has a really good shot and release, and I think that offensive confidence is coming with him where he can chip in down there as well. But he’s just a very well-rounded player that’s probably very ready to contribute right away, and he’s coming in with a pretty good track record. He’s a mature guy, so he’ll have a big impact. Bryce Hatten – Is a kid that is big, he has good feet for a big guy, really good stick, rangy, solid, simple defender that’s tough to play against. Coming off a year where he missed much of the season with an injury, and he’s worked hard to get himself back to 100 percent. He’s probably going to need a little time to get back into hockey shape and just feeling comfortable out there when we get to contact and really get going. But a talented kid that really takes pride in defending and not giving much up. Excited to see him transition to college hockey. Chaz Switzer – Played three years in the USHL, I think he’s been committed the longest among this group on the back end. A lot of edge, physical, tough, left-hand shot which we haven’t had too many of those guys, so that’s helpful. And again, he understands his game and his role and he really likes to just plays defense and shut guys down. We like the compete level there and the balance between those guys. Jared Brandt – Older kid that was a captain in Minot last season with Christian Mohs and had a very successful career. He skates really well, has good poise with the puck, makes solid plays, was very successful on the power play. Another left-handed shot and a guy that can play both ends of the rink and comes in as a seasoned guy with a lot of maturity. A balanced group, a little bit older – actually I think the whole class is older, Willie (Knierim) is the only true freshman – so we have guys that even though they’re freshmen have played a lot of hockey and are a little bit older, and typically it’s a little bit easier for those guys to transition to college hockey as opposed to 18-year-old kids that have just graduated from high school. BoB: Is it by design with how the NCHC is structured, with everyone seemingly 6-feet-3, 220 pounds, to bring in older, more physically developed players on the blue line? Petraglia: Well, it’s a case by case basis. I think the thing for us is it’s not age but it’s bringing in kids that are ready to play right away. So if a kid’s ready at 18 and he’s ready to come in and make an impact – that’s harder to find – typically it takes a bit of seasoning because college hockey is older and the development path and just the structure of it allows for extra years of development with the junior hockey landscape. Taking advantage of that time is something that’s beneficial to almost everybody. I guess it’s partially by design but for the most part it’s just making sure that guys come in when they’re ready to contribute, because we don’t want anybody coming in, sitting in the stands and struggling. BoB: So goaltending. You have nine minutes and 39 seconds of experience returning in net, so can you talk about your goaltending group? Petraglia: We’ve been here before with the way our tandems have worked, the guys staying in the same class, and that’s not something that’s held us back in the past actually. The last few times this has happened we’ve won the CCHA championship (in 2013) and the time before that we went to the national championship game and the time before that it was Charlie Effinger and Jeff Zatkoff, and they ran with it right away, and that team won a championship as well. Not to compare anybody but just saying that the structure of that is not something we’re afraid of or nervous about. We’re excited about the group coming in. Ryan Larkin – Has been committed for a while and didn’t play last year because of injury except for a couple of games. High IQ, great poise and demeanor in net, and just a well-accomplished high-end goalie. The biggest thing for him is he’s really not coming in as a freshman because he enrolled and was here in January because of his injury – he has a full semester of Miami underneath his belt. He knows his teammates and he knows what the program is all about because he’s already lived it. Even though he didn’t play, he’s coming into the fall comfortable with his surroundings and has the confidence in his health, so he’s going to be a guy who obviously plays an enormous roll on our team. And it’s nice that’s coming in as a freshman that has some understanding of what things are really like at this level. Excited about him. Chase Munroe – Big kid from Chicago, again, has a real calm demeanor in net. Fills a ton of space, tracks the puck well, understands the game. He’s a kid that we got a little later in the process, but somebody that has a high ceiling and a lot of potential and had a real solid season for the Minnesota Wilderness (of the NAHL). Andrew Masters – Evan McCarthy is still going through some injury problems that he’s dealing with in rehabbing, so he’ll not be available for us for a while, and that’s why we had to go out and recruit another goalie after the season so we had the proper depth. Andrew Masters is a kid that had a very successful season last year in Georgetown (Ont. ), was the goalie of the year in his league and one of the top goalies in the Canadian Juniors system, so it will be exciting to see what he can come in and show us. But at the end of day, we’re looking for these guys to all work together and great teammates, and whoever’s name is called on Friday and Saturday nights to get the job done and help us win games, whoever that’s going to be. BoB: You and Coach Brent Brekke both do recruiting for Miami, but as a former RedHawks goalie, do you handle more of the goaltender recruiting? Petraglia: No, I don’t think it matters. Obviously it’s a position I played and something I’m passionate about. We all work together as a staff to make those decisions, and we’re always involved in making choices for who would be best for our program. Can’t say I can take full credit for that – it’s something that we all work together on. BoB: Miami’s success in net has been something we’ve seen continuously over the past decade, including seasons like this one when the RedHawks have had two freshmen goaltenders. Is that something the coaching staff takes pride in? Petraglia: Yeah, we take a lot of pride in that. I think that’s not just credit to the goaltending, but just the whole team in general. It’s a situation where everybody’s got to be on the same page and buy into playing a team game, and I don’t care how good of a goalie you are, if you don’t have a team that’s playing well and buying in in front of you, it’s going to be hard to stop pucks. We do take pride in that, our team defense and especially our penalty kill, which has been very successful over the course of time – Coach Brekke does a great job with that – but just the buy in of everybody is a key part to our program. If we’re going to have a problem in that area, that’s not a good thing. Any good team is going to have good goaltending and good, solid team defense. It’s one of the biggest classes of incoming freshmen ever for Miami. The RedHawks have 14 freshman hitting the ice this fall, and assistant coach Nick Petraglia handles a large portion of Miami’s recruiting. So for the third straight summer, we talked to Petraglia about the team and the newest members of the program. BoB: So how is the off-season going for the coaching staff? Petraglia: It’s been great. A lot of time planning, and we all had some time away, obviously. I can tell you that we’re excited to get going here. We’ve all had time with our families but I know this season’s been on our minds the whole time and we’re charged up and ready to go. BoB: With 14 incoming freshmen, what kind of challenges does that create for a coaching staff? Petraglia: It’s a fun challenge. I think the most important thing is that we set the standard right away and they learn what our expectations are so they can make as seamless of a transition as possible. Obviously it’s going to be a learning curve for everybody, but just setting that culture, and we’ll lean on our returning players to do that right away. But with 14 guys being half of our team, the example we set and how we operate from a work ethic standpoint, a character standpoint, habits – just everything we do – trying to operate at the highest level possible right away so it becomes the way and we can just focus on getting better every single day, one day at a time. That’s what we’re going to try to do. BoB: You coaches are super-intense people and obviously bleed for the program, so do you feel even more pressure because this big class of freshmen is coming in – especially with how last season ended – because this group is half of your team for the next four years? Petraglia: No, I don’t think pressure is the way we look at it. I think we’re really excited. I will say that we very much believe in what we have in that room and what our culture is. We believe we have the right people and all the pieces of the puzzle are there and we just have to make sure they’re put together properly and guys are in a position to be themselves and be successful. Like I said, we’re very excited. We really love the class that’s coming in. We’re really happy with all of the work that’s been put in by the returning guys who have spent all of spring and the early parts of summer really taking the next step. We had a great summer with those guys in the weight room and off the ice and hopefully everything comes together as soon as possible. BoB: We’ve written briefly about the freshmen individually (NOTE: That story can be found here), but specifically, the forwards in general, it seems like you’ve got a good mix of smaller guys, bigger guys – obviously that’s what you want – so can you talk about that group? Petraglia: There’s a little bit of everything, and obviously that’s by design. Offensively, we have some guys that have proven they can produce. 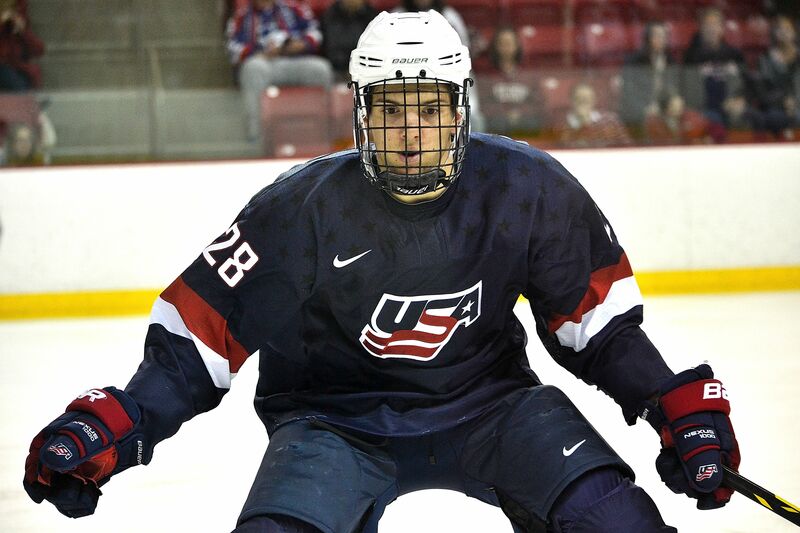 – Karch Bachman: Has elite speed, a really good shot, a scoring touch and is somebody who’s pretty electric. He missed a lot of last season because of injury and that’s why his numbers weren’t what you’d expect. But he’s a kid that has some high-end offensive ability and talent. – Carson Meyer: Had an incredible rookie season (in the USHL) helping Tri-City win the Clark Cup. He’s a kid that knows how to score, plays the game the right way, great shot, he’s a complete player that can hopefully contribute right away. A couple of kids coming from Dubuque that have been committed for a while. – Gordie Green: A smaller guy who plays with a ton of passion and energy. He’s a rat out there – he’ll get under your skin and he’s not afraid of anything. His biggest strength is just his hockey sense and playmaking ability. So he’s a guy that can make a lot happen, and we expect him to be a major contributor. – Willie Knierim: (Green’s) teammate last year, the youngest guy in the class. Big power forward. The best thing about Willie is he knows his game and he takes pride in it. He doesn’t try to be something that he’s not. He’s got a nice set of hands, he knows how to score. He’s really good around the net, he’s good in the corners and he’s one of those players that as a power forward can really complement skilled guys around him. Very excited about those two coming in. – Carter Johnson: Is an older, mature player from the North American League. He’s one of our Canadians that we have coming in – first ones in a while from Canada – he’s a well-rounded centerman that I think is going to surprise a lot of people. He plays both ends of the ice sheet, he skates well, he has good skills. He’s produced a decent amount throughout his career, and he’s just a big body that understands the game and gets around well, so he should be able to fill in an important role on our team. – Alex Alger: Is a guy that’s been committed for a long time. He plays with a lot of energy, he can skate, he’s not afraid to be physical, he’s got a good shot. He played a big role on his team up in Johnstown the last couple of years, so hopefully he can come in and make an impact. – Christan Mohs: Is a guy that just plays with a relentless compete level. Really good on the forecheck, a ton of energy, produced in Minot in the North American League, had a very successful career. I think he’s coming in here as that program’s all-time leading scorer. But just the way he plays – he gets after it and he’s tough to play against and he adds that element. Part II of our interview with Coach Petraglia will cover the defensemen and all-important three freshmen goalies. That will be posted on Sunday, Sept. 11. On the strength of 44 saves from freshman phenom Ryan McKay and goals from classmates Riley Barber and Matthew Caito, the #3 Miami RedHawks defeated Lake Superior State 2-1 Saturday night in Sault Ste. Marie, Mich. In doing so, the RedHawks are now just one point away from clinching a share of the final CCHA regular season title and two points from an outright championship to close the league. Frankly, going into this season with so many new faces and young players, I would not have predicted a regular season title. 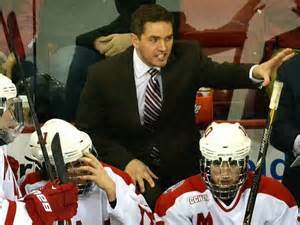 But this team, coached so well by head man Enrico Blasi and his associates Brent Brekke and Nick Petraglia have molded the 2012-13 RedHawks (21-8-5, 16-6-4-4 1st CCHA) into an intense, system-based and fast squad that is a nightmare to play against. The RedHawks lead the nation in team defense and are sixth in penalty killing despite an offense that has just one point-per-game player (Barber) and no skaters ranked higher than 14th (Barber) in the national scoring race.